Nova FSV, the high quality finished single vision lens from Vision Rx Lab is all you need to know about! Vision Rx Lab, one of the leading manufacturers of ophthalmic lenses, has introduced another innovative lens category under its flagship brand Nova. 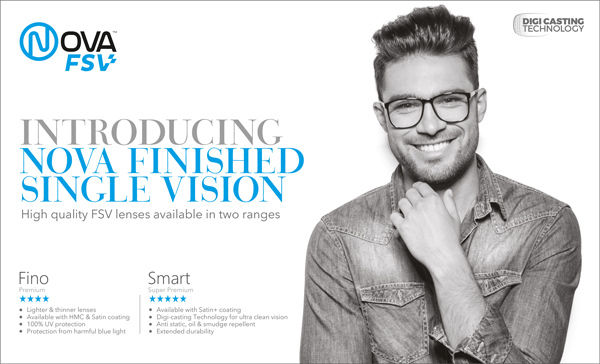 Nova FSV is a high quality finished single vision lens (available in two categories – Smart and Fino) which meets the expectation of the consumers who are more aware and want best quality lenses at best prices. Unlike traditional process, Nova FSV Smart is created by digi-casting technology using glass moulds which are produced with state-of-the-art digi-contour technology that uses software based lens design involving high order optical calculations and digital surfacing equipment to create lenses with highest precision. Nova FSV Smart offers extra-sharpness, higher clarity, wider field of stress free vision and comes with Satin Plus coating which makes it anti-static, water, oil and smudge repellent. It is available in 1.50 and 1.59 indices. 1.59 polycarbonate monomer is casted through Extrusion Compression Moulding 9 process, yielding stress free polycarbonate lens with double aspheric design. Nova FSV Smart will soon be available in Trivex (1.53 index) and also with state-the-art photochromic option in 1.50 as Transitions Signature VII in three colours i.e., grey, brown and green. Nova FSV is also available in Fino range. This SV lens is not only lighter and thinner than conventionally surfaced lens it also provides extra clarity and visual comfort and is available in the following indices and designs: 1.50, 1.55 Aspheric, 1.56, 1.59 Aspheric, 1.60 Aspheric, 1.67 Aspheric which comes with either Hard Multi Coating or Satin Coating. These lenses come with 100% protection against harmful UV rays. In 1.56 Aspheric and 1.60 Aspheric materials, it comes with Blumax – the effective protection against harmful UV rays and HEV Blue light up to 420 nmt. 1.55 Aspheric is an impact resistant lens with UV protection and Satin Relief coating (blue ARC) which acts as first line of defence against harmful blue light.